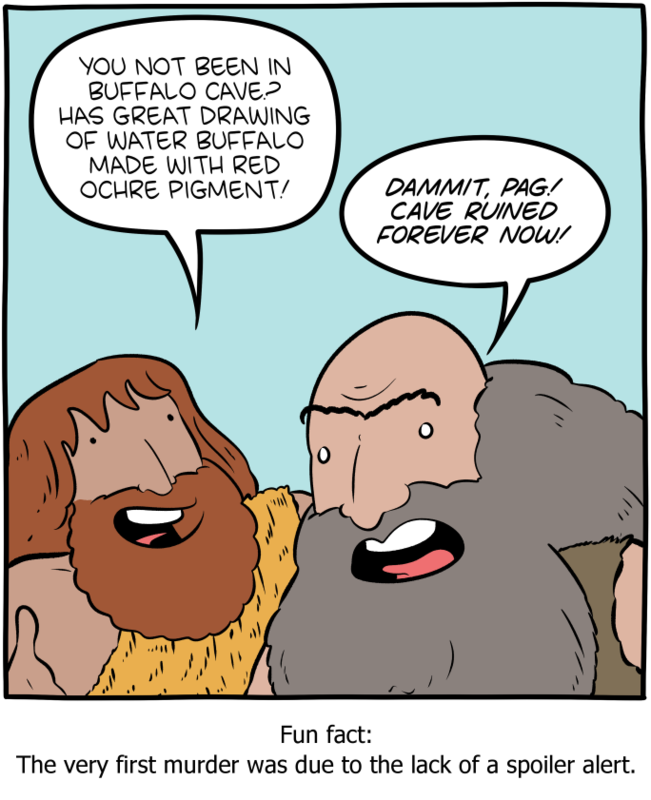 SMBC Comics Forum • View topic - [2019-02-10] Cave :: Old Spoiler Competition! [2019-02-10] Cave :: Old Spoiler Competition! 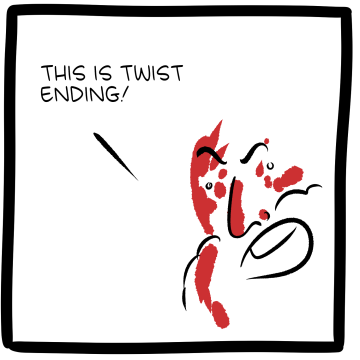 I wonder if there's a rat experiment analog for spoiler-related anger. I hereby declare this thread a competition to post a spoiler for the oldest possible work of fiction. Declare the title of what you're spoiling. Use spoiler tags if you know how. No matter how old, spoilers are still spoilers! You can post an old spoiler even if an older one has already been posted. You just won't win any internet points. Nothing from the year 2000 onwards - obviously not old enough! Re: [2019-02-10] Cave :: Old Spoiler Competition! Fight Club, 1999: Tyler Durden is the unnamed protagonist's insomnia-induced alter-ego. They are the same person! It's not relevant to the competition, but I assume folks around here have heard of the attempted murder in the antarctic? Waladil wrote: It's not relevant to the competition, but I assume folks around here have heard of the attempted murder in the antarctic? I haven't, but damn. I feel for that guy. The walking spoiler got what he deserves. Soylent Green (1973): is people! Beowulf kills Grendel and Grendel's momma but can't solo a dragon. If Wiglaf didn't grow a pair and help out we'd all be dragon food.